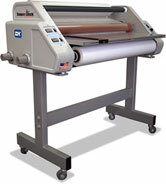 Advanced Document Systems & Supply has been selling high quality Laminating Machines and Laminators since 1994. We carry a large selection of Pouch and Roll Laminating Machines and Laminators, designed to laminate all sizes of pouches and documents up to 27" wide. We also offer Wide Format Laminating Machines, for digital graphics and mounting; Single Sided Laminating Machines, for book covers, brochures, and magazine covers; and Photo ID Laminating Machines, for badges and identification cards. 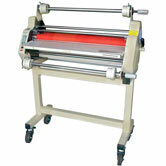 Furthermore, we offer a large selection of lamination equipment: supplies, tools, and accessories. Browse our selection of high quality heat activated laminating rolls, xyron 1200 & 2500 laminate rolls, and laminate pouches in different shapes, sizes, and thicknesses. We have a wide selection of Pouch Laminating Supplies of varying sizes and thickness to meet your needs. 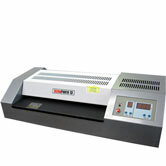 If you are in need of a Laminator or Laminating Machine, then look no further, ADSS is your choice! 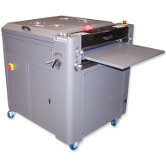 Enhance and protect printed pieces with a UV Coater. Add a gloss, satin, or matte finish to both offset and digital prints with one of our UV coating machines. Top coat covers, business cards, direct mail, and more. UV coating resists water and handling damage and intensifies colors for a better presentation.